I used my new toy, the Making Memories 12×12 Paper Trimmer, which is so lovely. Is it me, or is there just an unrelenting search for a decent trimmer when you papercraft? I’ve finished the charm as well, and will upload it tomorrow. 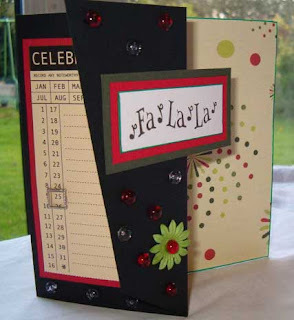 Using black cardstock, make the usual Z-card with the Score-it board, then stamp “fa-la-la” onto small piece of white cardstock. Edge with metallic marker, then matt onto red, and then green cardstock. Cover the lefthand side with the Chloe’s Closet Xmas paper, and run the green metallic marker aroundt the edge. Add Zoomz to the fold back section of the righthand side, also add a green daisy with a Zoomz in the middle. On the farleft portion, matt the Celebration tag onto red cardstock and stick slightly towards the top. Add three Chiaro Zoomz to the bottom. Add a silver frame square brad over the 25.
although I have to say that I am not all happy with this, and it will be a do-over. The frame wasn’t that bad, but I’ve made a complete hash of the rest of it (definitely under par). Probably has something to do with having had a rotten day, and then rushing it. Still the idea is there now, and I will take off the central frame bit next week. I know that, most certainly the 3 needs to be in chipboard, and the Sophie is should be smaller, as it just swamps the whole thing. was to make a small card the size on an ATC. This is my entry. It’s made from a scap piece of Wild Asparagus paper, trimmed to front lefthand side with the Purple Cow flutted blade, and the bit that was cut off I added the other way round as a border, with a Zoomz (Chiaro). The scallop was sitting on my desk, and I used one of Aud’s Circle Sentiments and coloured with my COPICS. Then I punched holes all around the scallop. 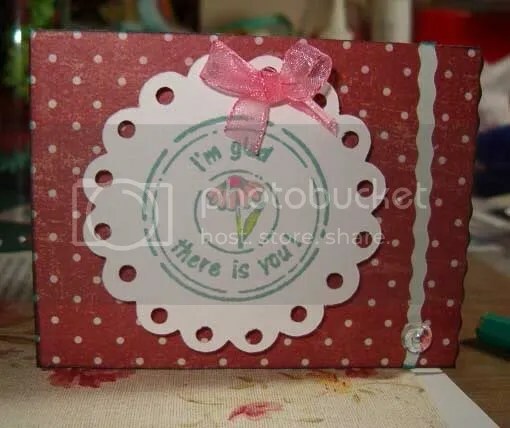 Inside has “Celebrate” stamped from my Hero Arts definition set. 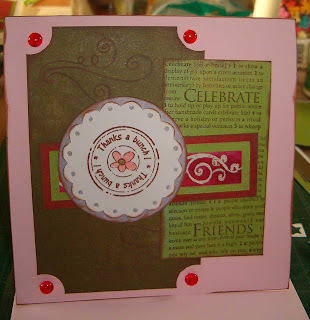 Take one of the PM pink cardblanks, and edge with the Gingerbread Versamagic ink pad. 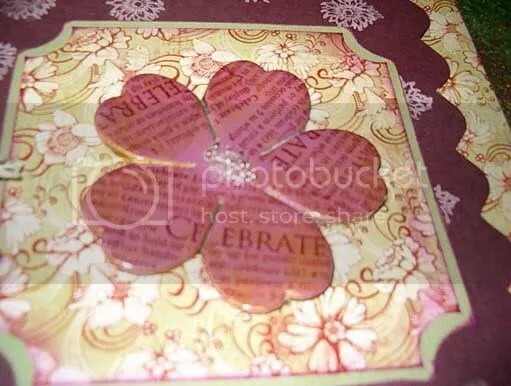 Take a piece of the brown BG “Mellow” paper, and cut to 3 1/4 x 4 3/4″, then use the star punch on the corners. To turn it into a ticker corner style, cut off the stars as per the image. 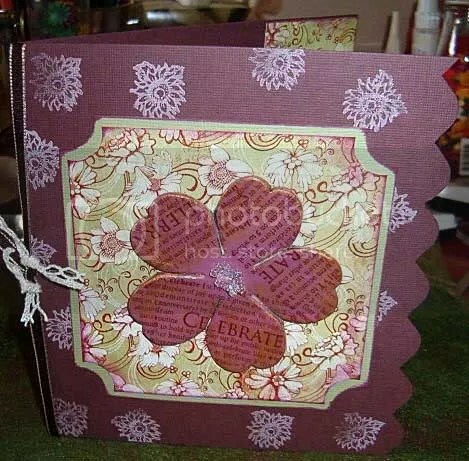 Stamp the swirls from the Flower & Swirls sheet at top left and right hand corners in the Gingerbread Versamagic. Run the same ink around the edges of the whole piece before adhering as per the picture. Take 4 Rudolph’s Nose Zoomz and place one into each corner. Take a piece of the green BG “Mellow” paper, and cut to approx. 2″ x 3 1/2″. Stamp with the Hero Arts stamps using Gingerbread Versamgic ink. Edge around the edges before you adhere it to the righthand side of the brown layer, just overlapping slightly. Take the swirl sticker from the Stickeroos sheet, and matt onto some green and then red BG paper from the “Mellow” stack. Place this matted sticker over both the brown and green layers. Using the Cricut cut out a circle at 2 1/2″ in the Lilac Rain (Lily Kate) and a 2″ scallop in White Prims cardstock. Stamp “Thanks a bunch” circle sentiment from the Circle & Sentiments Aud Sheet. Colour in the small flower in the centre with the Rose Copic, and the Lime Green for the flower centre. After I took the picture I added a tiny self-adhesvie pearl to the centre. Stamp “celebrate” from the Hero Arts set in the card, and also on the envie in Gingerbread Versamagic. Take a piece of 12×12 Prism cardstock, and cut in half to measure 6×12″. 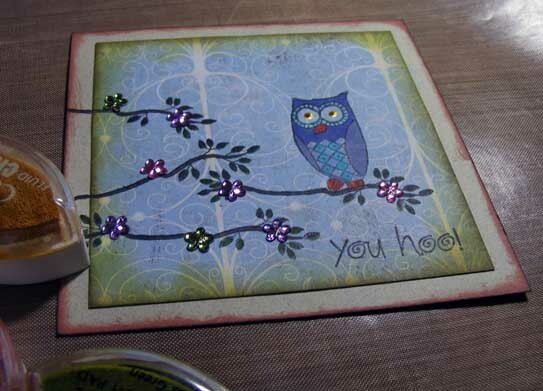 Use the Scor-it board to make a fold in the centre so that it’s a 6×6″ card. Take a piece of the green paper from the BG Mellow stack, and cut to 5 1/2 x 5 1/2″. Use the star corner punch, and then cut off the stars to make turn them into Ticket Corners. Run the Perfect Pulmeria Versamagic all around the edges. Take a piece of the red paper from the BG Mellow stack and cut to 5 1/4 x 5 1/4″, and do the make the same ticket corners. 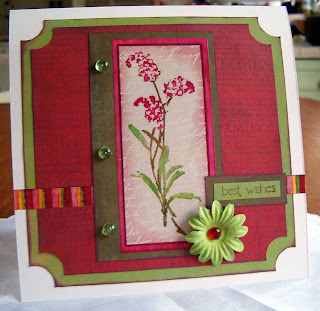 Stamp all over with the Hero Arts Friends, Family, Celebrate stamps using Perfect Pulmeria Versamagic. Run the Perfect Pulmeria Versamagic all around the edges. Layer this on top of the green paper. Take the long stripped sticker from the Flower Field Stickeroos sheet, and place about 2/3rds of the way down across the whole card, and trim the edges. Take the flower image from the Stickeroos sheet, and matt onto the BG Brown paper. Trim to 1/4″ on top, bottom and righthand sides, leave a 1/2″ border down the lefthand side. With glossy accents, stick three Ginko Zoomz down this larger border at equal distance. Stamp “best wishes” onto some of the small leftover bit of BG Green paper, and matt onto BG Brown paper. Run the Perfect Pulmeria around the edges. Place this on the righthand side over the stripped border. 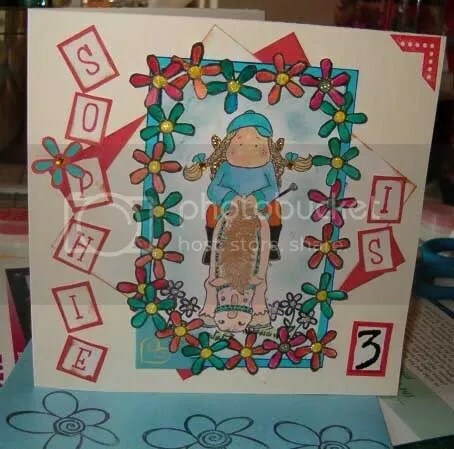 Take one of the Prima Daisy Crazy Jasmine flowers and place on the corner of the main image. Add a Rudolph’s Nose Zoomz in the centre with glossy accents.